Warning: The ChevronWP7 unlocking tool has been removed and discontinued, and the steps below are no longer supported by the developers. However, if you are interested in unlocking your Windows Phone 7 device at your own risk, you may follow the steps below. WindowsPhoneHacker does not support or condone the use of unsupported tools. We are NOT responsible for any damages caused to you or your device by following this tutorial. 2) Extract the ChevronWP7.cer certificate from the ChevronWP7.zip file. 3) Attach the ChevronWP7.cer file to an email, and send the email to an account associated with your Windows Phone 7 device. 4) Open up the email on your Windows Phone 7 device, and click on the ChevronWP7.cer attachment. Once it downloads, tap it again to install. 5) Press Install when prompted to by your device to add the developer certificate. 7) Run ChevronWP7.exe, and check both boxes. Click Unlock, and it should succeed. If not, jump to Troubleshooting below. Your device is now developer unlocked! Continue below to change your ringtone. 8) Download and extract ChevronWP7 custom ringtone manager. 9) Create a ringtone in WMA format. You can use Windows Movie Maker to do so-just use the audio track and leave the video blank. Additionally, you can use Expression Encoder. 10) Run ChevronWP7 custom ringtone manager, and select your ringtone(s). 11) Press "Build ringtone XAP"
12) Run the Application Deployment tool from the developer tools ([Only Registered and Activated users can see Content. 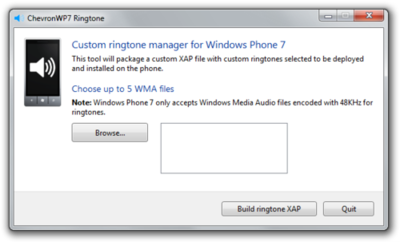 ), and deploy the XAP in the folder with ChevronWP7 ringtone manager. 13) Once it succeeds, click on ChevronWP7 Ringtones in your phone's start menu. 14) Navigate to settings and select your ringtone. You're done! Special thanks to the ChevronWP7 team for making this possible. 1) Make sure you have the certificate installed and your device is completely connected to your PC. 2) Make sure your device's screen is on and sitting on the Start screen. We now have the first WP7 homebrew application taking advantage of unlocked phones - a Windows Phone 7 custom ringtone manager. Desktop application - used to build a custom XAP package with 5 custom ringtones you select from your computer (Requires [Only Registered and Activated users can see Content. Ringtones have to be in the WMA format at 48KHz as required by the OS. We recommend using [Only Registered and Activated users can see Content. (free) to transcode any MP3s. Currently, to deploy the XAP you will have to use the Microsoft “Application Deployment” tool with the [Only Registered and Activated users can see Content.
. In the future, we hope to make available a standalone deployment solution for homebrew apps. All times are GMT +6. The time now is 09:51 PM.